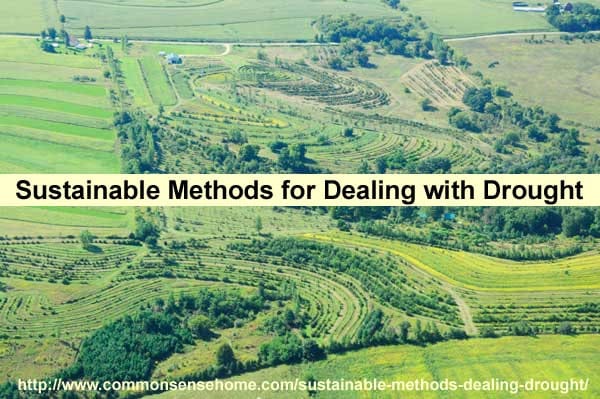 Given the wild weather that's been thumping parts of the U.S. and the rest of the world, I wanted to share an article I found recently titled, “Sustainable Methods for Dealing with Drought” by Dr. Phil Wheeler. While the author is primarily focused on farm scale production, the advice is just as good for the home gardener trying to feed their family. I'll include my notes and additional resources in italics. The first point to make is that it is easier to prepare for drought before you are in one than to try to rescue yourself from one your already experiencing. Regardless of what stage you're in, the principles which will be addressed here are the same. Three processes are involved: Capturing the rain that falls on your farm, holding a good portion of it in the topsoil for immediate use, and allowing the rest to go into the subsoil where it can come back up to the topsoil when needed. Capturing rain requires good soil structure. Good soil structure is usually damaged by simplistic N-P-K fertilization. Growers need to learn that there are six major nutrients; calcium, nitrogen, phosphorous, potassium, magnesium, and sulfur. Calcium is the king of nutrients and must be dealt with outside of the pH concept. A good cation exchange test [CEC] will help you begin to balance the 6 majors to influence structure. At the same time as you are using nutrients to attempt to correct structure, you can also use sub-soiling and soil conditioners to get rain to go through the topsoil and into the subsoil. In my garden, I aim to either keep the ground covered with growing things or mulch. The soil is only bare for short periods of time. Naked ground = more runoff and evaporation. Healthy soil traps the rain. For an excellent example of farm scale permaculture in practice, check out Restoration Agriculture, which was written by a farmer in southwest Wisconsin who has turned 106 acres of worn soil into a highly productive and ecologically diverse farm. The photo at the top of this post is courtesy of New Forest Farm, and features contour plowing and planting as well as extensive perennial ground cover. For a more detailed discussion of soil minerals, you can visit the Smiling Gardener Organic Fertilizer review. In the post “What if I told you weeds and bacteria could save your life?“, I discuss how cutting trees actually creates desertification. Holding moisture in the topsoil requires the presence of biologically active carbon. The main source of this is organic matter that has been turned into humus by the digestion of microbes. In order to get the soil biology to come back, a grower has to learn how to reduce chemical inputs that impact the microbes and provide new food sources for them. Changing to post emergence herbicides is a start. Direct application of carbohydrates such as molasses or sugar provides high energy feed for the microbes to use when they are taking up nitrogen for retention against leaching and release when needed by the plant. Green manure crops should be disked into the surface to provide a more complete food supply for the microbes. Treating them with small amounts of N and sugar will assure their immediate breakdown for use by the current crop. The presence of good humus will combine with the structure from balanced minerals to give the soil that great smelling, moisture and nutrient holding aggregate structure that we all would love to have. Moisture can also be held by providing dust mulch covers which act as insulators against evaporation, but still allow the all important oxygen to penetrate for the microbes to breath. Very light tillage can be used to create the dust mulch cover without turning up moist soil. Let’s assume we have managed to get rain to go into our subsoil by breaking up hardpans and creating better topsoil. The sun on the soil surface will create a draw that will bring the moisture toward the surface. The more pathways for the moisture to travel the more that will come up to the root zone. Typical pathways include wormholes, openings and cracks created by sub-soiling, spaces created by soil conditioners, deep root paths, etc. To assure that new plant roots can reach downward as far as possible, build an implement with a deep thin blade that can create a channel under each row. Late in the season, go out with a shovel and prove to yourself how far roots can go down that channel compared to roots that don’t find the path of least resistance. Burrowing creatures, such as prairie dogs, open millions upon millions of tubes in the soil of Earth. As Mollison notes, these “burrows of spiders, gophers, and worms are to the soil what the alveoli of our lungs are to our body.” As the moon passes overhead the underground aquifers rise and fall and Earth breathes out moisture-laden air. This exhalation of negative-ion-charged air through the many fissures and tubes opened by the burrowing creatures helps create rain. How could indigenous peoples have known this? By all our standards of scientific knowledge they could not. We have neglected to realize that indigenous peoples have always had access to the finest probe ever conceived, one that makes scientific instruments coarse in comparison, one that all human beings in all places and times have had access to: the focused power of human consciousness. Long story short – living soil, filled with critters big and small, will naturally contain pathways to allow water to move up from the subsoil. The author has been observing farms for thirty years in the US and many foreign countries. Whenever there is a drought in a given area, the farms that have practiced the principles of sustainable agriculture always come out better. They may have a reduced yield, but in relation to their neighbors, they get a better yield. One of the reasons for this, besides the moisture management we have mentioned above, is that their crops and soil attract dew to a much greater extent than their neighbors. This has to do with a very complex relationship involving the electrical/magnetic nature of plants and soil. It takes 2-3 years to restore structure and biological activity. Get started now! This article was written by Dr. Phil Wheeler and reprinted with permission. In 1971, Dr Phil Wheeler started his own organic farming operation near Vestaburg, MI while working for Michigan Tech University. He and his wife Louisa raised their children while tending goats, collecting eggs, raising organic beef, pork and lamb for direct marketing and unloading truckloads of natural fertilizers. Phil then worked for a Michigan company selling and developing biologically orientated soil and foliar products. For about 10 years Phil was a partner in TransNational AGronomy, Ltd whereupon he started CSI with his wife Louisa. Phil is co-author of The Non-Toxic Farming Handbook. He and Louisa have four grandchildren and enjoy spending long weekends on their houseboat. You can join their sustainable farming mailing list and order detailed soil analysis at Crop Services International. Leave a comment and share your gardening challenges, ideas or questions, and we may feature them in an upcoming post! You may also enjoy other Gardening articles. I’ve just started learning about permaculture and look forward to integrating more of it into our homestead.